A long time ago in a galaxy far far away (or maybe just Arizona), a shandy was created! The Shando Calrissian is named for famed smuggler Lando Calrissian and is as good as anything you’d find in Bespin’s Cloud City and you won’t have to lose a hand (too soon?) to make one yourself! Inspired by the fact that all of our friends are enjoying Phoenix Comicon this weekend, we wanted to come up with a cocktail that those of us could enjoy and join our geek brethren in spirit! This was further solidified when we remembered that SanTan Brewing Co. makes a galactic IPA called Moonjuice! 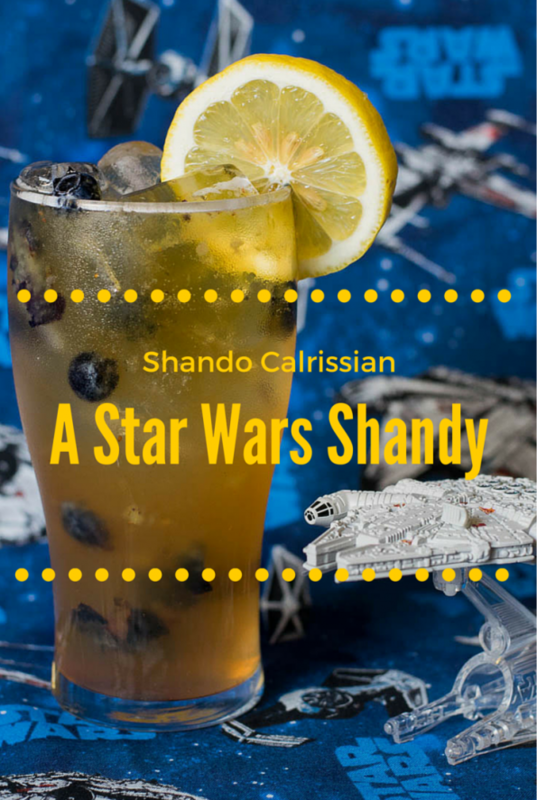 Thus, this Star Wars inspired shandy was born. So whether you are enjoying Phoenix Comicon this weekend or watching it from your Facebook feed, we hope you enjoy our Shando Calrissian! Put blueberries in 16 oz pint glass. Lightly muddle so as to break them down but not completely pulverize them. Garnish with lemon slice and more blueberries if desired. I LOVE a good Shandy… what a great idea to add blueberries!